L'Informale title: "Tough Challenges in the Middle East: An interview with Daniel Pipes." The Italian original of the interview is at "Sfide Impegnative in Medioriente: intervista a Daniel Pipes." Question: President Trump's very first stop abroad - before Israel and the Vatican – will be in Saudi Arabia. What do you make of this surprising decision? Answer: Everything about Donald Trump surprises, from the day he announced for the presidency two years ago until now, so this trip fits into part of a much larger pattern. It's unprecedented for a president not to visit first a Central American, North American, or Western European country. Why does Trump bestow this honor on Saudi Arabia? I suppose he wants both to redeem his anti-Muslim reputation and galvanize governments against Tehran. Round One of Trump's diplomacy with the Saudi monarchy began on Mar. 14 in Washington with Deputy Crown Prince Mohammad bin Salman. 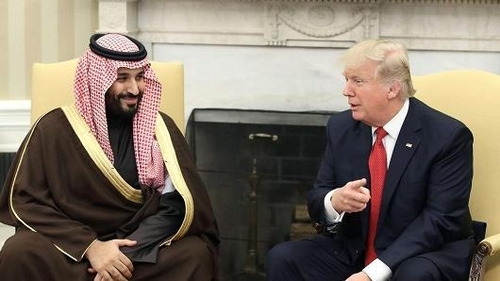 Q: Why do Americans see Riyadh as less dangerous than Tehran, given that the Saudi government has invested enormous funds to spread its Wahhabi version of Islam, thereby increasing Islamism and jihadism? A: Easy: Tehran is simply antagonistic whereas Riyadh plays a complex game of cooperating with Washington on the political-military level while portraying Christian and Jews as the enemy on the educational-religious level. Q: Since 1979, the Islamic Republic of Iran has exported extremism and terrorism targeting in particular Americans and Jews. It is currently fighting in Lebanon, Syria, Iraq, and Yemen. Do you see Iran's power continuing to grow? A: I do not. Iran benefits right now from almost two decades of stable leadership, the JCPOA, and unrest in the Arabic-speaking countries. But all this could soon change, leaving the Islamic Republic of Iran much weakened. Q: The Syrian crisis gave the Russians a chance to return to the Middle East, yet President Trump has stated that Vladimir Putin is a potential partner. Do you agree? A: I do not. Putin's main foreign policy goal is to gain power and prestige at the expense of the United States, so he cannot be a partner. 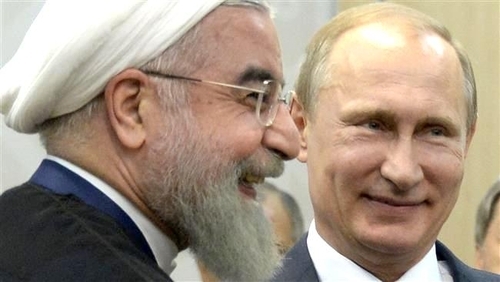 It's all smiles when Russia's President Putin (R) meets Iran's President Rouhani. Q: Reactionary and would-be totalitarian forces, such as the governments of China, Russia, Iran, Turkey, and Venezuela, seem to be gaining at the expense of the liberal democratic order. Do you agree? A: Yes, the liberal democratic order reached its high-water mark with the Soviet collapse in 1991 and has been in decline ever since. Poor Western leadership partially accounts for this, as does the perennial allure of bad political choices outside the West. Q: During his campaign, Donald Trump called for "America First," a seeming Jacksonian pull back from the troubles of the world. As president, however, he has abandoned many of those positions. Will the U.S. government continue with its traditional post-1945 positions? A; Trump has reversed himself on innumerable campaign pledges. This is easily explained, for he had only simplistic opinions before becoming president, after which he has been learning about the complexities and realities of the world. Fortunately, he has not insisted on sticking with his earlier ignorance but has been willing to absorb new materials. So, yes, I think he will stick with something along the standard post-1945 policies. Q: You wrote in January, in "A New Strategy for Israeli Victory," that "When enough Palestinians abandon the dream of eliminating Israel, they will make the concessions needed to end the conflict. To end the conflict, Israel must convince 50 percent and more of the Palestinians that they have lost." But Daniel Polisar of Jerusalem's Shalem College found, in a recent examination of hundreds of Palestinian surveys, that the majority of Palestinians reject an Israel alongside Palestine by as much as 3 to 1. How do you respond to this data? A: Polisar finds variously that 25, 30, and 32 percent of Palestinians are willing to live alongside a Jewish state; these numbers slightly exceed my estimate of 20 percent of Palestinians accepting Israel's existence. So, (1) his estimate is more optimistic than my own and (2) there's a lot of work ahead to turn these low proportions into a majority. Q: Most observers see Trump as far more favorable to Israel than Obama. Do you agree? A: Trump is learning on the job and we have no idea where his education will take him. One can envisage scenarios from his being very friendly to very hostile toward Israel, and everything in between. If I must predict, I expect mild hostility – because egomaniacs tend to be more gratified visiting Riyadh and Dubai than Jerusalem and Tel Aviv. Dubai, a real estate developer's dream. Q: The amended Hamas charter states that all of Palestine belongs to the Muslim umma, reminding us of the Islamist refusal to Israel and the longstanding Arab and Islamic rejectionism of the Jewish state. If the Israeli-Arab conflict was from its inception a religious war, this makes it particularly difficult to resolve. Do you agree? A: I do. Although mostly hidden, the religious basis of the Arab-Israeli conflict has always been key. The fact that Jews historically lacked power makes the creation of Israel the more bitter and unpalatable. That Zionists purchased Israel rather than stole Palestine makes matters even more humiliating. Q: Islam is at its core both a theological and political system. How can we reasonably expect such a system to accommodate Western values without destroying its intrinsic logic? In other words, isn't jihadism inevitable? A: No, it's not. All religions – indeed, all human creations – change over time. Christianity and Judaism a few centuries ago differed profoundly from their current manifestations. Islam has changed in many ways over the past half-century. This being the case, there is every reason to think that Islam will continue to change; let's hope it modernizes and jihadism disappears.